I wanted to write up a bit of information to consider when introducing a new puppy to existing pets. A lot of people may be tempted to just bring a new pup home and add it to the mix right away. While that may work in a few situations, more often it pays to take time. If there is an existing dog, and it's not used to puppies, I would strongly suggest using some caution in initial introductions. Maybe have a baby or pet gate in a doorway, with the pup on one side and adult dog on the other. Let them have time, even days, to get used to each other with the safety of the gate. I take days and sometimes weeks to introduce new adult dogs this way, and even with pups it can be helpful, especially if the resident dog isn't used to sharing space with a baby pup. Remember, you are trying to build a lifelong relationship, so it pays to take your time. Dogs and especially puppies are impressionable, and bad experiences early on can be hard to overcome. Another thing to consider is that an adult dog may even snap at a puppy, from being annoyed by a pushy puppy wanting to interact, or to "correct" the pup for real or perceived misbehavior. Not all adult dogs use an appropriate amount of force, some could injure or kill a puppy with one bite, on purpose or by accident. My own dogs have good social skills and I trust them, but I have put a lot of time into ensuring they had a lot of practice as puppies and even into adulthood, learning to interact appropriately with puppies and other dogs. Still I use a lot of caution and supervision during new introductions. Many pet dogs don't have nearly the number of opportunities to practice canine social skills, so may be very lacking. I always urge a lot of caution in those cases, especially until the puppy is big enough that a warning bite will not cause serious or fatal consequences. Some of the biggest sources of conflict will be resources. By that I mean food, food bowls, toys, chewies, prime locations for sleeping or attention, and of course attention from the people in the family. While I don't like to use the word jealousy in these situations, I do use the word competition! Dogs compete for things that are important to them, and they may not appreciate a puppy coming in who wants to take things they think belong to them. I STRONGLY recommend feeding meals, not free feeding, as puppies will not know the adult dog's "rules" and may try to eat from the adult dog's bowl. If you feed meals, it puts YOU in charge, as in you own the food and the bowls, and you say when the dogs eat. You remove the bowls after the meals, to further lessen a chance of conflict or competition. Also, with more than one dog, you will have more insight into your dogs' eating habits if you feed meals, as one may go off it's food but since the food level goes down with the other eating it, you may not know right away. With the competition of another dog, some dogs begin to overeat and become overweight. Sometimes different dogs in the house need different foods, supplements or medications, and by feeding meals, you can ensure each dog gets the right amount and type of diet. If there are any toys that are high value, and one dog may be prone to guard it, don't allow free and unsupervised access to the toy or toys, especially not at first. I would suggest you only get out the really good toys when you can closely supervise, but use them as a way to build positive associations with the new dog. By that I mean good toys come out when both dog and pup are in the same room, and go away when the pup is removed. The adult dog will come to see the presence of the new puppy means good stuff happens. 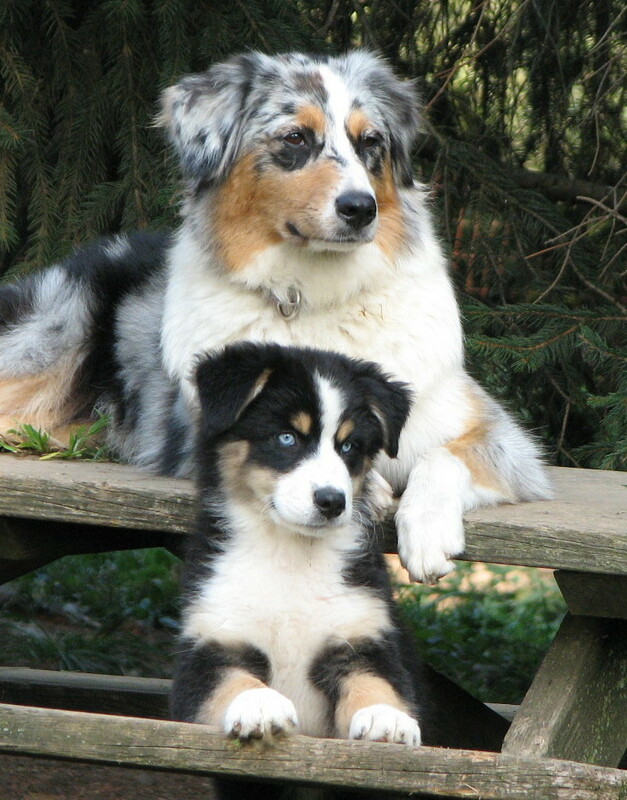 You can use food rewards in the same way, or any other thing or activity (such as walks or interactive play) to build a good bond between the adult dog and new pup. Along those lines, I do recommend walking the pup and new dog together, if it can be done safely. By that I mean there are safe places to walk the pup that won't expose him to disease or bad experiences during this vulnerable time. If you can't do regular short walks, playing in the yard together will work too, at least until the puppy is fully vaccinated. You want your adult dog not to see the pup as competition, but a companion that further ensures lots of good things happen. 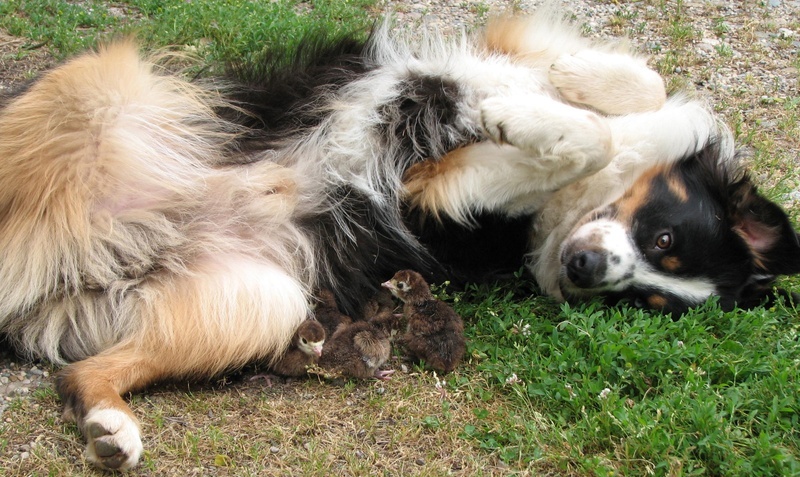 Soon you will be on the way toward having a happy doggy family! With introducing a puppy to a resident cat, you should take care not to let the pup be harmed. A cat can scratch a puppy in the face, or worse yet the eyes, and cause real damage. It would be a good idea to trim your cat's nails before doing any introductions. If the cat is not likely to be happy with the new pup, make sure she has plenty of room to escape. Most cats will lay low with a new dog in residence, and that's fine. Cats tend to warm up at their own pace, and giving them space ensures they feel secure enough to do that. If your cat is more outgoing and comfortable with dogs, I still would caution you not to allow the new puppy to practice rough play, chasing or biting of the cat. Puppies learn to hunt by "playing" this way, and I don't feel it's in the best interest of the cat's future safety to allow such "games." Calm greetings and interactions are best and they are what I would work toward and allow. As far as other pets, especially small pets, I would take caution. Even though many Aussies are quite appropriate and nurturing of small "helpless" creatures, they are still dogs and that means predators. Don't leave a puppy and small pet alone together, or it may be tragic for the small pet. That is even more true of an older pup or adult dog who may have stronger instincts. Depending on the species of small pet, the dog may be trained to be safe with them over time and with work and supervision, but don't count on it. Just take precautions to keep your small pets safe. With Aussies and larger animals such as cattle, horses and other livestock, be aware that as a herding dog, they will have a very STRONG urge to move animals, or be quite reactive to the movement of such animals. They will want to control the movement of other animals. A horse especially can be deadly to a dog who doesn't know to be careful. Even sheep or cattle can kill a pup or dog with a kick or stampede. If you plan to have your pup around livestock, it is good to learn how to safely introduce them to it. 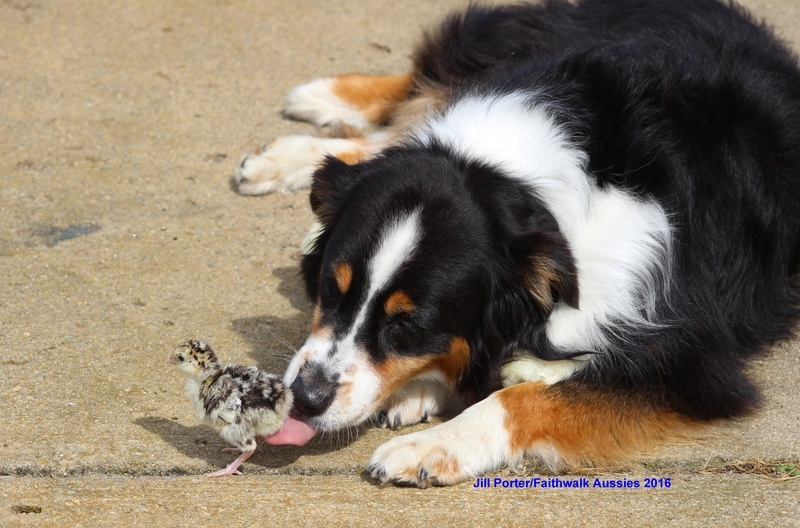 There are plenty of good resources out there for training a stock dog Until then, and during the process of training, don't allow your Aussie unsupervised access to stock, lest it be hurt or just learn bad habits. 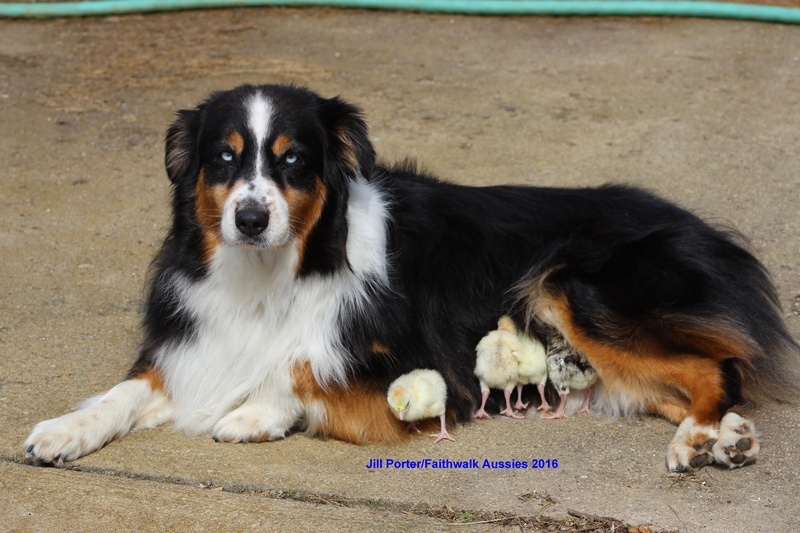 As working stock dogs, Aussies can be a valuable asset on a farm or ranch, but they will need some work on your part to behave and respond appropriately. Great info on WORKING Aussies!